General Electric (GE) continues to charge ahead in renewable energy with the recent purchase of a 51 percent stake in a northern Oklahoma wind farm. The total cost for the project, called Chisholm View, will be $375 million, with GE kicking in $191 million of the total cost. The remainder of the project’s financing will come from the Italian company Enel Green Power. The new Oklahoma wind farm will span 85 miles (137 kilometres) and use 140 1.6 megawatt wind turbines. Unsurprisingly, all 140 wind turbines will be built by GE – the company is also the largest supplier of wind turbines in the U.S. The recent purchase brings GE’s wind portfolio up to a sizeable 9.6 gigawatts of capacity. At this rate, GE is pushing ahead in the clean tech sector, and setting itself up for a competitive advantage into the future. The strategy would score points with Warren Buffett, who recently highlighted the correlation between sustainability and profitability. GE’s Oklahoma wind farm is scheduled to be completed by the end of this year, just in time to receive elibility for a 2.2 cents per kWh federal tax credit. The Chisholm View project is expected to generate $5 million for local coffers from lease payments and taxes. An additional 150 short-term construction jobs will also be created. However, only 15 long-term positions will be created from Chisholm View. Power generated from its wind turbines will offset the emissions of 565,000 metric tons of greenhouse gases – the equivalent of taking 110,000 vehicles off the road. 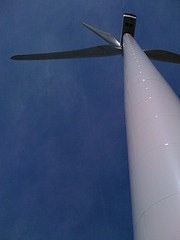 What are your thoughts on the future of wind energy? Do you think projects like these will improve GE’s bottom line in the long-term?